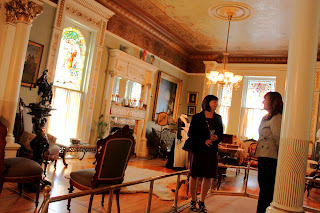 Tonight we were invited to an industry open house at Craigdarroch Castle. At the time (circa 1890) mansions in Victoria were going for about $15,000. 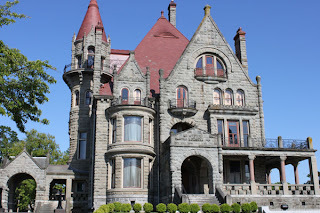 Craigdarroch Castle cost coal baron Robert Dunsmuir many millions. 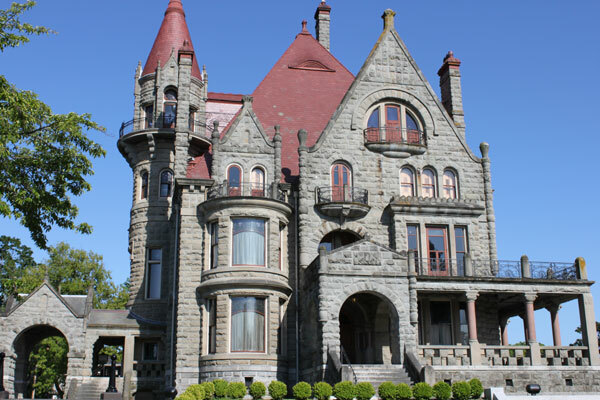 When you tour this fabulous four story (plus tower), you will see the exquisite stained glass, the intricate woodwork and the expensive furnishings that filled the castle. This palatial home has 25,572 sq. ft. of space. It took 5 rail cars to bring the 2128 oak panels from Chicago. There are 17 fireplaces and seven long chimney stacks. The castle had gas lighting, electric lighting, hot and cold running water for indoor plumbing, central heating, telephones, and even a burglar alarm. It is easy to see why this restored castle is designated as a National Historic Site. It was completed in 1890. Robert Dunsmuir died before its completion, so only his wife Joan, three of their daughters and two orphaned grandchildren lived on the 28 acre estate. The castle is owned by a not-for-profit charity (The Craigdarroch Castle Historical Museum Society) and the conservation of this national treasure is funded almost exclusively from revenue contributions from the 100,000 annual visitors. If you missed today’s tour, tough luck! This is an amazing place. There is information throughout the castle that teaches you about the furnishings, the people of the time, what they wore, and much more. There are volunteers throughout the building that would be thrilled to share their knowledge about the castle with you. It is such a great attraction, one that visitors should not miss. There are seasonal events at the castle that make it even more interesting. If you have not been there yet, it is time you went there. There was a lady we met there today who has lived In Victoria for 20 years and this was her first visit. Don’t wait 20 years and when you do visit, be a generous visitor and leave a healthy donation. It takes a lot of money to keep up with the renovations and upgrades. For more photos, please visit our Facebook Page.